October 17, 2016 By This post may contain affiliate links. 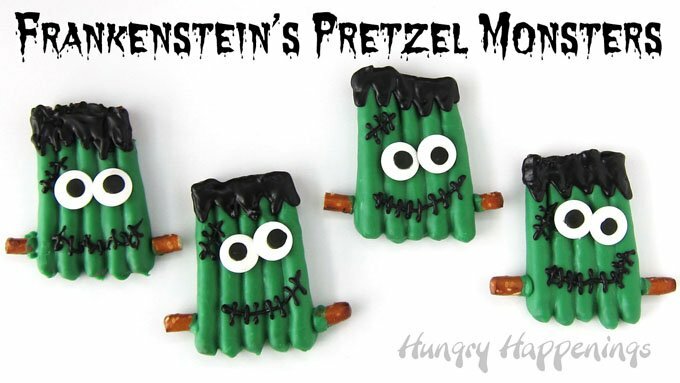 Have fun this Halloween in your kitchen laboratory building Frankenstein’s Pretzel Monsters. See how easy these sweet and salty holiday treats are to make by watching the video tutorial. Have you and your kids made crafts using popsicle sticks? I remember saving all our popsicle sticks so we could make all sorts of crafty creations when I was a kid. Now as an adult almost all of the crafts I make are the edible kind so last year I came up with an edible alternative to the wooden sticks used to make holiday crafts. I use Snyder’s of Hanover Pretzel Dipping Sticks to craft sweet treats for holidays and special occasions. Pretzel Dipping Sticks are longer and thicker than traditional pretzel sticks and shorter and thinner than the pretzel logs. They are the perfect size to all sorts of candy coated treats. I found bags of Dipping Sticks at Kroger, but they are also available on-line on Amazon.com (affiliate link). If you can’t find them, you can make some adjustments and follow my tutorial for making White Chocolate Easter Pretzel Chick using the skinnier pretzel sticks. I have had so much fun crafting sweet treats using the pretzel dipping sticks. So far I’ve made Chocolate Snowman Pretzels, Chocolate Penguin Pretzels, Chocolate Pretzel Reindeer, White Chocolate Pretzel Olaf, Chocolate Pretzel Scarecrows, Chocolate Pretzel Turkeys, Black Crow Pretzels, and White Chocolate Easter Chicks all out of chocolate coated pretzels. I just couldn’t let Halloween pass by without making at least one chocolate pretzel treat. 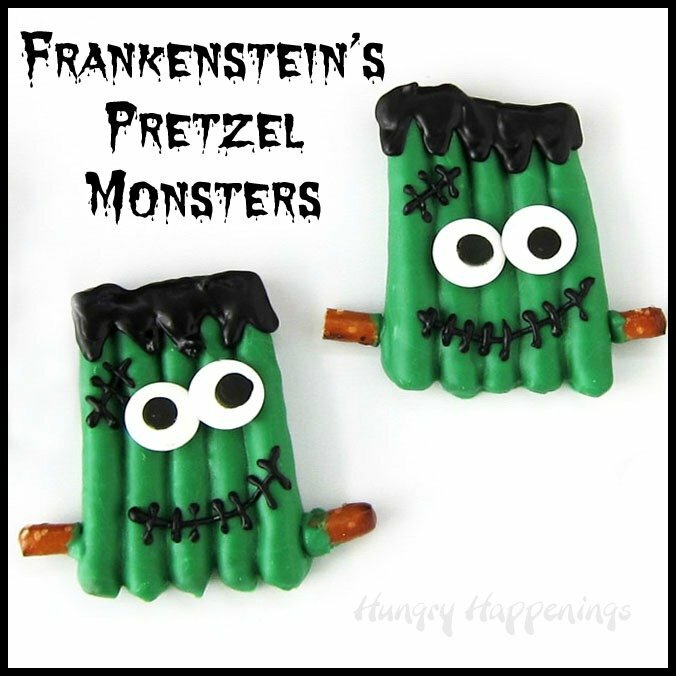 Don’t you just love these Frankenstein’s Pretzel Monsters? They are so easy to make and being they are monsters you don’t even have to be neat. They can look crooked, bumpy and messy and still look like perfect monsters. You can watch the video below the recipe to see how these fun Halloween treats are made then check out any of the other tutorials listed above if you’d like to see step-by-step photos of the pretzel dipping process. You can find items needed to make your own Frankenstein’s Monster Pretzels on Amazon.com (affiliate links). Candy coated pretzel dipping sticks are decorated to look like Frankenstein's Monster for Halloween. *See detailed information regarding using Candy Melts/Confectionery Coating on my Chocolate Making Tips page. You will have extra chocolate leftover after dipping. Add some broken pretzels to it and spread it out on some parchment paper. Refrigerate until set, break, and enjoy a snack. Arrange sets of 5 Pretzel Dipping Sticks on a parchment paper lined baking sheet. Pour melted green candy melts into a tall glass or mug. Dip one pretzel in the green candy melts so that all but about 1/2 inch at one end is covered. Lift out of candy coating and allow excess to drip off. Set on the parchment lined baking sheet. Dip a second pretzel then set it so that it sticks to the first pretzel. Repeat until you have all five dipped pretzels stuck to each other forming a rectangle. Freeze for 3-4 minutes until the candy coating hardens. Let sit at room temperature for 5 minutes before decorating. Pour black candy melts into a zip top bag and snip the tip off of one end. Pipe black candy melts over the exposed edge of the pretzels making the candy look like hair. Pipe a scar and a mouth onto each pretzel. Pipe a dot of black candy melts on the back side of two candy eyes and attach them to each of the pretzels. Pop in the freezer for 1-2 minutes until the candy coating hardens. Break or cut enough dipping pretzels to create 36 small pieces, approximately 1/2 inch in length. Dip one end of two pretzel pieces in melted green candy melts and attach on either side of the pretzel monster to create it's bolts. You will have extra candy coating when you are finished dipping your pretzels, so just toss in some broken pretzels, stir, then spread it out onto a parchment paper lined baking sheet, freeze for 5 minutes, remove, break into pieces, and enjoy a snack. 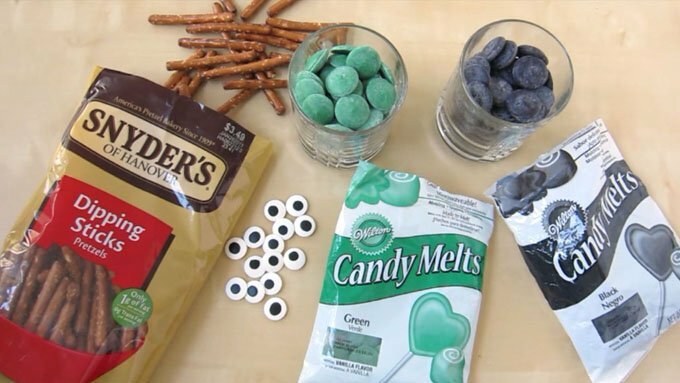 To keep your green candy coated pretzels from forming white spots or streaks, get them into the freezer quickly after they are dipped. So, dip and form two monsters, then pop those in the freezer, and continue making two more and repeating the process. When you can make even Frankenstein look cute!! 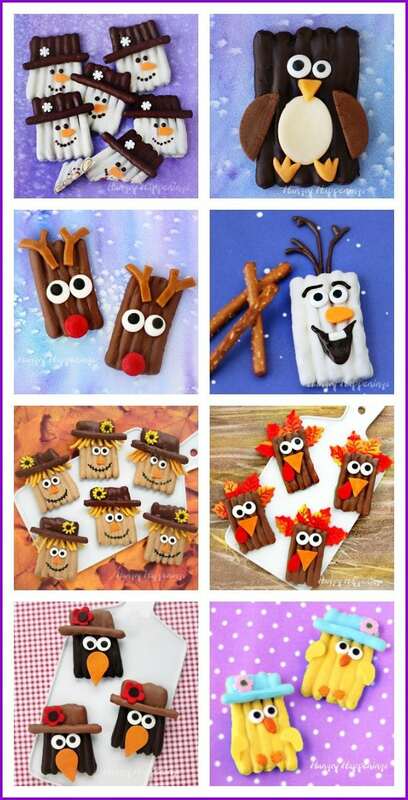 Your pretzel crafts are some of my favorites that you make! I love all the creations you’ve made with the pretzels, Frank is a great addition to the collection!